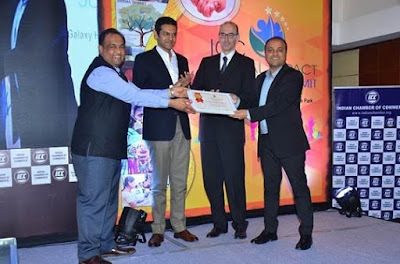 Tetra Pak India, the world’s leading packaging and processing solutions provider was felicitated with the ‘Indian Chamber of Commerce (ICC) Social Impact’ award in the ‘Sustainable Environment Category’. The award recognizes Tetra Pak’s leading efforts in setting up a sustainable ecosystem for recycling of used Tetra Pak cartons, using a multistakeholder approach and delivering measurable impact. The award recognizes excellence of organisations in the sphere of social investment, corporate social responsibility and sustainability. More than 80 project nominations were received across different project categories from corporates, NGOs and implementation agencies, of which 40 were shortlisted for further evaluation. Tetra Pak cartons are primarily paper based and fully recyclable. When recycled, they can be turned into many useful items like roofing sheets, classroom furniture, planters, notebooks, bags and more. Tetra Pak started establishing a recycling ecosystem for used cartons in the early 2000s, partnering with stakeholders across the recycling value chain. Tetra Pak has also invested significantly in sensitizing consumers on their role in waste management and recycling through programs like Go Green with Tetra Pak, in partnership with RUR Greenlife and Sahakari Bhandar in 2010, and a waste segregation program called ‘Alag Karo’, in partnership with Coca Cola India and GiZ.